Enter for your chance to win prizes instantly just by entering UPC codes from your favorite Mars Snackfood US candies. Prepare for a creepy-candy encounter of the ghoulish kind! Face freaky phantoms, scary spooks and ghastly ghosts this Halloween for a chance to win $1,000,000. Eligibility: open to individual legal residents of the State of Maine, age 18 or older as of 8/14/09 and individual legal residents of the other 49 United States & DC, age 13 or older as of 8/14/09 are eligible to participate. Additional eligibility restrictions may apply. Entry Dates: The Mars Snackfood Halloween Million Sweepstakes beings at noon Eastern Time on 8/14/09 and ends at 11:59:59 PM (ET) ON 10/31/09. How to Enter: To participate in the Mars Snackfood Halloween Million Sweepstakes, visit HalloweenMillion.com and enter a UPC Code. When you register you will need to verify your account by email to play. UPC Codes are available on the outside of selected M&M’S® Brand, SNICKERS® Brand, 3MUSKETEERS® Brand, TWIX® Brand, MILKY WAY® Brand, SKITTLES® Brand and STARBURST® Brand products. If you do not have a UPC Code, one free entry per person and per email address is available at HalloweenMillion.com. UPC Code Limit: one (1) On-line UPC Code per email address during the Contest Period. Each On-Line UPC Code may be used only once; other UPC Codes may be used more than once. ALL PLAYS MUST BE COMPLETED BY 11:59 PM (ET) ON 10/31/09. Each play will be deemed to have been submitted by the record holder of the Email address from which the play originated. Entry Limit: one (1) play per email address per person per day; if more than one play per email address per person per day is submitted, only the first such play will be eligible. One (1) Sweepstakes Grand Prize: One million dollars ($1,000,000) awarded in the form of a non-transferable annuity paid in approximately equal annual installments of $33,333 for thirty (30) years without interest. (10) Instant Win Game First Prizes: Four (4) one-day tickets to a Six Flags® Theme Park of winner’s choice. ARV: $184 each. (1,000) Instant Win Game Third Prizes: $25 awarded as a check made payable to winner. (20,000) Instant Win Game Fourth Prizes: one (1) coupon redeemable for a free package of M&M’S® Brand Milk Chocolate Candies, M&M’S® Brand Peanut Chocolate Candies, M&M’S® Brand Dark Chocolate Candies, M&M’S® Brand Peanut Dark Chocolate Candies or M&M’S® Brand Almond Chocolate Candies (9.9 oz – 12.6 oz.). ARV: $2.99 each. 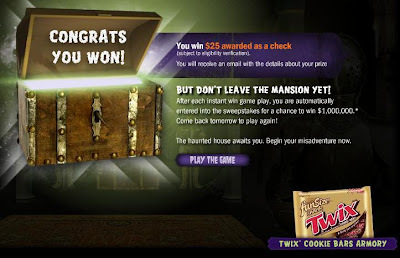 Check out Amy’s Halloween Millions winning screenshot. Prize Limit: one (1) InstantWin Game First Prize or Second Prize per household and one (1) Instant Win Game Prize per household per day. SELECTION OF SWEEPSTAKES GRAND PRIZE WINNER: Potential Sweepstakes Grand Prize Winner will be determined from all eligible entries received in a random drawing to be conducted by the Judges on or about 11/6/09. Second Chance Drawing: All unclaimed Instant Win Game First and Second Prizes will be awarded in a Second Chance Drawing, assuming a sufficient number of eligible entries. Each time you play the Instant Win Game Whether you win or not, you will be automatically entered in the Second Chance Drawing. Prize winners will be determined from all eligible entries received in a random drawing to be conducted on or about 11/30/09. FINALLY! I just won a bag of candy! I finally won a bag of M&Ms! can you only play once a day? I just won $25 and previously candy! i can't win a thing…i have been entering faithly for about 3 weeks and nothing…everybody says luck ant got nothing to do with it then get in my shoes….i ant got no luck…. Has anyone else had a problem with registering? I never received my activation email. Therefore I cant play. It tells me that everytime I try. Ive sent 3 emails to the contact us link and havent heard anything. Ive even tried resetting password and I wait for an email and nothing…. Ive tried re- registering but it tells me Im already registered and click on the email link!!! UGH! I just won some candy! I used the 3 Musketeers code! Sweet!! Same problem here.. no activation email. I tried signing up again and it said I was already registered but not activated and that I needed to use the email link that I received when I first registered in order to activate account… DUH! I won a candy coupon today! No problems playing. However… I have not been able to find any legitimate codes for this game on my own since it started. Seems like bad luck to keep using these same"generously(thankyou!" supplied codes every day. Are there any codes still out there on packages? Thanks! Yea! Won some candy today!! This is a tough one to win, but it's possible! I've played it every day since it started and just won my second bag of candy last night. A valid code from Snickers is 04010207. I won on 04003100 last night. Keep trying…good luck everyone! I won a $25 check on September 2, and still no prize. I have emailed them 4 times and they just keep replying back with some automated statement about second chance drawing. This has nothing to do with that!! Help!!! Just received a $25 check in the mail today. Won it sometime in August/Sept (can't remember). Thanks so much sweetie.